In most ecosystems ambrosia beetles are a natural part of the recycling system, starting or promoting the decay of stressed, diseased or dying trees, shrubs and vines. Ambrosia beetles were named for the symbiotic “ambrosia” fungus they cultivate. The beetles do not feed upon the wood, but as they bore into the xylem (heartwood), galleries are infected with fungi carried by the beetles. This fungal growth lines the galleries and serves as food for the developing larvae. In addition, the fungus stains the area surrounding the gallery producing characteristic dark centered pinholes. Ambrosia beetles are a very effective vector of moving the fungus from tree to tree which ultimately kills the trees. Synergy’s new Multitrap system or Funnel Trap II are good options for trapping ambrosia beetles. Ambrosia beetles are an example of convergent evolution with several groups independently developing the symbiotic lifestyle of fungus farming and forming an ecological guild. Most ambrosia beetles are generalists and will infest a range of host trees and shrubs. Tropical habitats support greater ambrosia beetle species diversity than do temperate habitats. The fungal compliment carried by each species of beetle is different and these fungi have a range of phytopathoegenic activities. There are hundreds of species of beetles and fungi of which little detail is known. Ambrosia beetles use semiochemicals to locate appropriate hosts, and to recognize symbionts and mates. Most ambrosia beetles respond to ethanol as a signal of dead and fermenting plant tissue. Many use semiochemicals for host selection as well as recognition of their microbial symbiotic partners. Whether you are mass trapping or population monitoring, Synergy Semiochemicals has products that offer previously unprecedented sensitivity and selectivity for those looking to survey invasive species and to probe the biodiversity of an ecosystem. In the ambrosia beetle tribes Platypoidinae, Xyloterini and Pityophtorini, females produce aggregation pheromones like lineatin, quercivorol, sulcatol and sulcatone which draw in both males and females. In the tribe Xyloborini, the males are flightless and the females can produce offspring via parthenogenesis where females lay haploid (unfertilized) eggs or diploid (fertilized) eggs. In parthenogenesis of Xyloborini, it is thought there is little need for true pheromones in order for the population to expand. Some ambrosia beetles have become pests in their native habitats. For example, Platypus quercivorus kills ancient stands of oak in Japan while Platypus koryoensis causes oak mortality in Korea. The striped ambrosia beetle, Trypodendron lineatum is a timber and lumber pest in North America and Europe. The pitted ambrosia beetle, Corthylus punctatissimus can cause significant damage in sugar maple when populations are high. Bio-security and regulatory agencies have become increasingly aware of the ability of the ambrosia beetles and their fungi to invade new habitats and kill trees. 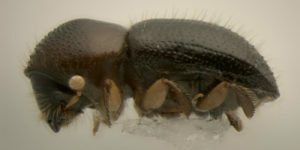 Ambrosia beetles are among the most commonly intercepted exotic species at ports of entry in North America and many have become serious pests when introduced to new ecosystems. Megaplatypus mutatus from South America was introduced to Hazel nut orchards in Italy where it is causing problems. 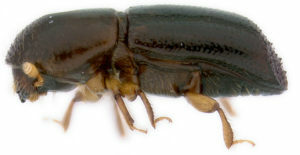 The Granulate ambrosia beetle, Xylosandrus crassiusculus was introduced to the US from China in the 1970’s. Since then the beetle has spread across much of the US and has become a dominant species in some areas. It causes problems in nurseries, orchards, and landscaped areas killing young fruit and nut trees and several species of ornamentals. Similarly the introduction of the Camphor shothole borer, Cnestus mutilatus, the European shot hole borer, Xyleborus dispar and the Black stem borer, Xylosandrus germanus has led to these insects becoming orchard and nursery pests. The Black twig borer, Xylosandrus compactus was introduced to Hawaii where it is now a pest in coffee plantations. Redbay ambrosia beetle, Xyleborus glabratus and the Polyphagous shot hole borer, Euwallacea fornicatus are two recently introduced species. Both carry new lethal strains of pathogenic fungi, never seen before in North America. Redbay ambrosia beetle brought Laurel Wilt disease to the south eastern US where large numbers of native Redbay, Swampbay and Sasafrass have been killed. The disease has moved to the avocado groves of southern Florida where it continues to spread, aided by other species of ambrosia beetles now carrying the disease. Polyphagous shot hole borer, introduced to both Israel and southern California, brought a new species of phytotoxic Fusarium, which kills both native and non-native trees, including avocado and pomegranate. Once again foreign invasive species have had negative ecological and economic impacts. Mass trapping Trypodendron and Gnathotrichus beetles in British Columbia log yards, sorts and mills was one of the longest running and most successful demonstrations of semiochemical – based insect controls in the world in the 1980’s and 90’s. Cost benefit ratio for the program was estimated at 4 to 1 that is, every dollar spent in the program saved the timber companies 4 dollars lost in damaged product. High potency lures were developed specifically for mass trapping and it was not unusual for about 100 traps to remove millions of beetles from each trapping site on an annual basis. High potency lures and many other new ambrosia beetle lures are directly available from Synergy Semiochemicals. If you are looking for lures for Hypothenemus, Hypothenemus hampei / Coffee Berry Borer, Platypus koryoensis, Platypus flavicornis, Xylosandrus crassiusculus / Granulate ambrosia beetle, Xylosandrus germanus / Black timber bark beetle which are not listed below, please contact us and we will be happy to offer a lure formulation for you.